Chef’s Log 64: ‘Tis the Season to Drink Coffee | The Spoon From Outer Space. Season’s greetings humans! Festivals are still an entirely new and (pardon the expression) alien concept for me, since we have nothing like it on my planet. However, I like the idea so much that I’m planning to introduce it on Gastronomica. I think it will pick up quite nicely, seeing as how festivals are (in my opinion at least) principally an excuse to gorge on delicious (and fattening) food. What I love about Christmas, more than any other festival, is the various Christmas-themed food that accompanies it. Not only do you get stuff like sugar cookies, plum cake, gingerbread men, eggnog, and so on (that is otherwise not available), but several institutions alter their regular menu to include limited edition Christmas specials. One such place is Starbucks. Now, Starbucks is supposedly one of those ‘evil corporations’ that certain cynical (and often smelly) humans keep ranting about. I personally think that this is an unfair perception. From what I can tell, Starbucks owes its success to its high-quality (albeit overpriced) coffee, and does not profit from directly causing others harm (an evil corporation in this regard would be a tobacco company). Nevertheless, I have no issues with franchises that standardize food or beverages, as long as they taste good. And Starbucks’ coffee certainly tastes good. 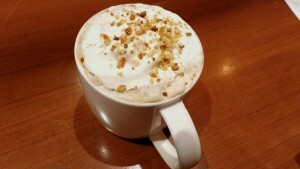 I tried the seasonal Toffee Nut Crunch coffee. As promised, it was simply bursting with a delicious yet subtle nutty flavour. The texture was smooth, almost buttery, and the cream topping added a velvety richness. The little chunks of nuts were nice little explosions of sweetness, but they could have been crunchier. 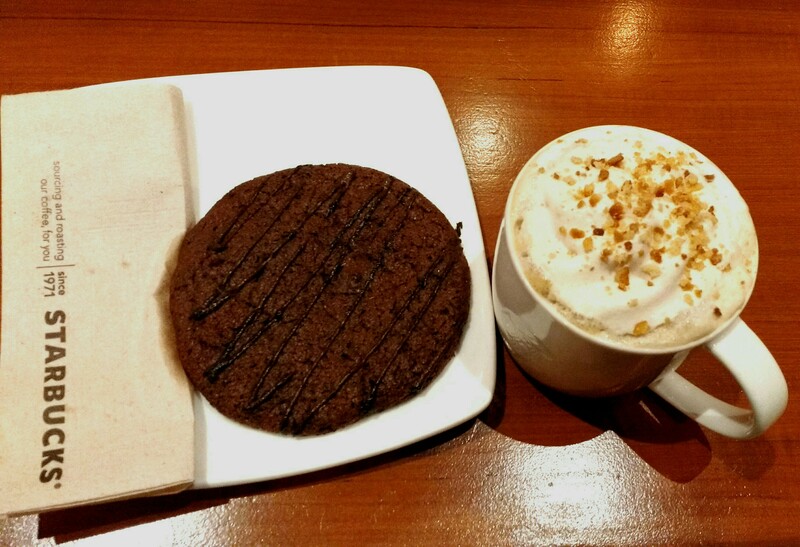 My coffee was accompanied by a chocolate cookie, which had an interesting, brownie-like texture and a lovely crunch, but could never compare to any of the cookies from the rival franchise Subway. It was certainly largely overshadowed by the coffee. Starbucks also offers two more (limited edition) seasonal flavours. So whether you’re anti-corporate or not, you can set aside your beliefs and worries for a little while to enjoy the perfect cup of coffee.